Early on the morning of September 7, 1776, an American soldier named Ezra Lee quietly approached the enemy. The HMS Eagle, a 64-gun British warship moored in New York Harbor, was Lee’s target. His goal was to fix three time-delayed explosives to its side. The task required nerves of steel: "When I rowed under the stern of the ship," he later wrote, "[I] could see the men on deck, & hear them talk." Lee soon ran into trouble. The ship's side was metal, not wood, and the explosive wouldn't screw in. Fearful of being spotted, he hightailed it out of there. When he saw that British soldiers were following him, he dropped the bomb into the water, frightening them away. About an hour later, it exploded, and everyone on both sides watched as it sent a massive jet of water up into the air. It's hard to blame Lee for his failure. His mode of transportation—made of wood, covered in tar, and shaped (as Lee put it) "like a round clam, but longer"—was completely unprecedented. 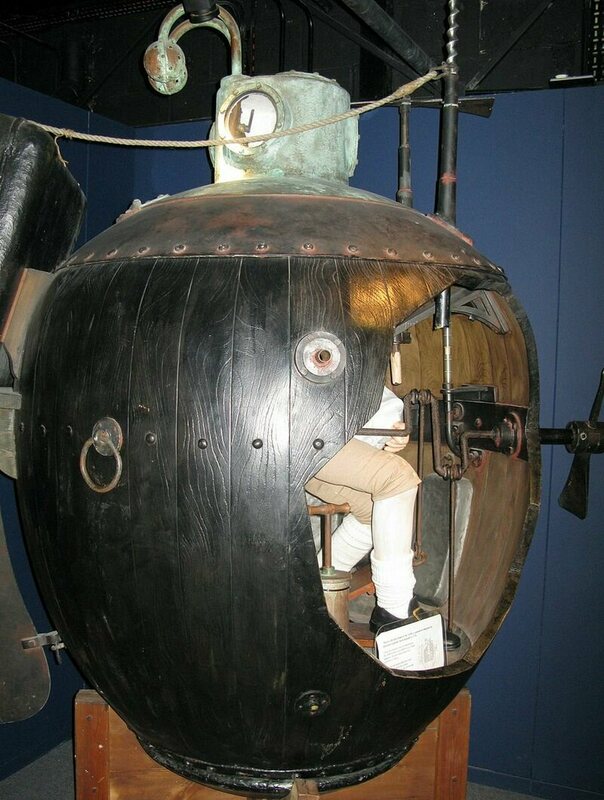 When Lee tried to blow up the Eagle, he was piloting the Turtle, the world's first combat submarine. Built by Americans during the Revolutionary War, it never had a successful mission, despite all of the out-of-the-shell thinking it displayed. The Turtle was the brainchild of David Bushnell, who began work on it in the early 1770s, when he was a student at Yale College. 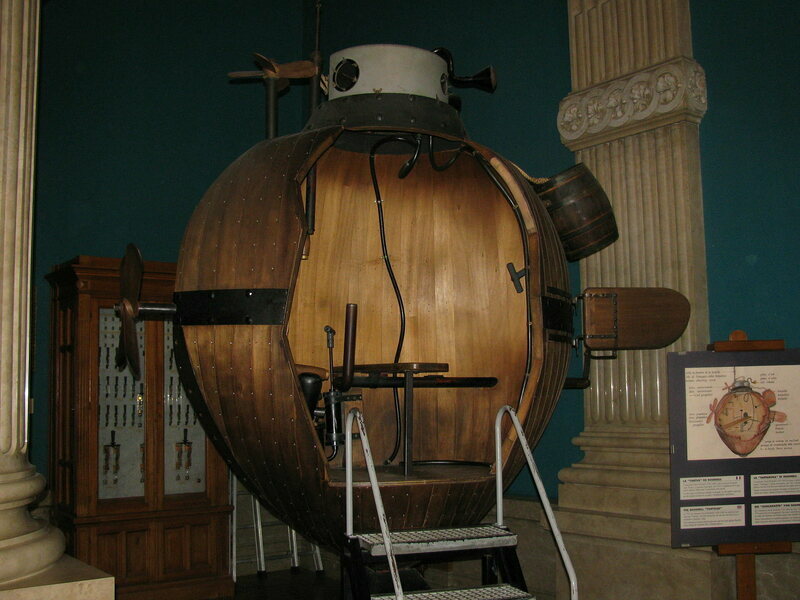 Bushnell was interested in the problem of underwater explosions: after much study, he managed to create the first ever underwater time bomb, packing gunpowder into a waterproof keg and creating a clock-based trigger mechanism. 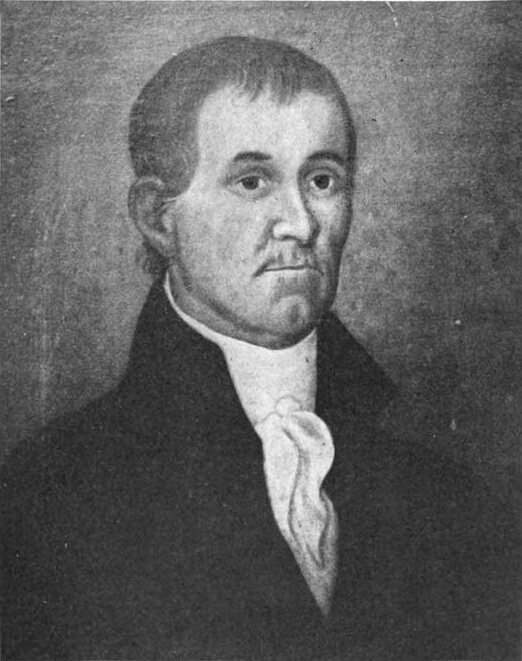 In 1775, after the battles of Lexington and Concord, Bushnell graduated and went back to his family farm. Freshly motivated, he pursued the next logical step: a machine that could quietly bring these submersible explosives where they needed to go. Over the next year, the Turtle began to take shape. 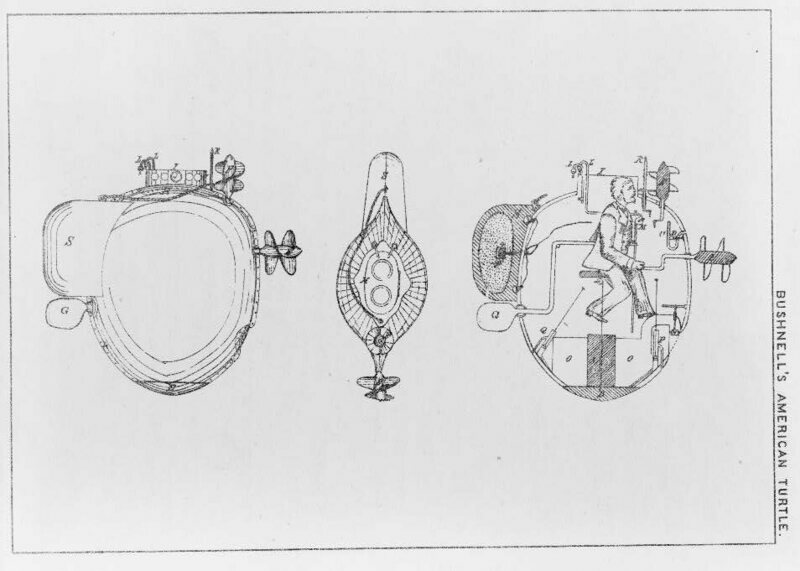 (A local clockmaker, Isaac Doolittle, helped design and construct some of the most ingenious parts.) About seven feet across in each direction, the whole thing was basically one giant cockpit. The pilot—or, as one admirer put it, "the adventurer concealed within"—sat on a chair in the middle. He was accompanied by half an hour's worth of breathable air, which he could replenish by bobbing up to the surface and uncapping a couple of bronze tubes in the ceiling. A complex series of pedals, cranks and hand rudders allowed said adventurer to move in all three dimensions: to sink and rise, move forwards and backwards, and turn. For daytime visibility, he could peer through a series of glass peepholes. At night, he had to go by the barometer and compass, which were illuminated by foxfire: wood infested with a bioluminescent fungus, which glowed well in the pitch-black water and, unlike a flame, didn't use up any oxygen. Another set of gizmos let him automatically attach the underwater bomb to the keel of the ship, and set off the clockwork mechanism that would trigger the explosion. Lee compared the submarine to a clam, and modern onlookers might be reminded of a human-sized hand grenade. But to Bushnell, its overall structure bore "some resemblance to two upper tortoise shells, of equal size, joined together"—thus its name. Bushnell tweaked and tested the Turtle repeatedly. His brother Ezra practiced piloting the sub in the Connecticut River until he could steer it with "perfect dexterity," as military surgeon James Thacher later wrote. Finally, on September 6, it was time to go after a real target, the Eagle. According to some sources, George Washington—who, though skeptical, had funded most of the development of the Turtle—was watching from the shore. But you know what they say about the best-laid plans of turtles and tinkerers. Before the attack could be carried out, Ezra Bushnell got sick. Lee—a soldier who had volunteered himself for naval exploits—was called upon to pilot the sub. He was only able to practice with it a few times before, late on the night of September 6, a couple of whaling boats towed him out into the harbor and left him to complete his mission. By the time he encountered the impenetrable metal hull, he had already been rowing for two-and-a-half hours. He didn't have the knowledge or the strength to find another entry point. The Turtle was put into action twice more, but never fruitfully, and was eventually captured by the British. Bushnell refocused himself on torpedoes, and found slightly more success. As for Lee, he earned a particular distinction: as his obituary put it when he died in 1821, "this officer is the only man of which it can be said that he fought the enemy upon land—upon water—and under the water."